Are there Chinese in Chinatown Costa Rica? Q COSTA RICA by Michael Miller – If you have any Costa Rican friends who live in San José, and you would like to see them laugh, bring up the subject of Barrio Chino. This is the city’s newly created Chinatown. 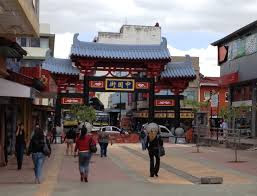 San José did not have a Chinatown until 3 years ago. It was in 2012 that the city took the very busy Calle 9, and converted 7 blocks of it into a pedestrian walkway. At the northern end of the walkway, on Avenida 2, they built a grand Chinese “welcome gate,” put up a sign that said “Barrio Chino” and announced to the world that San José now has a Chinatown. Tony, from Canton (Guangzhou), China, has been in Costa Rica for three years and speaks Spanish quite well. His store is called Tong Fei Hsiao Ke, and it has only been open a couple of weeks. We are not sure if Tony has decided on a Spanish name for his……..